BENSENVILLE (WLS) -- Five children were among seven injured after a crash in Bensenville Friday, police said. Police said the crash happened at about noon when a Ford Escape SUV made a left turn from a parking lot in the 200-block of West Grand Avenue and collided with a Ford 250 pickup truck. The pickup truck then collided with a Toyota Camry. 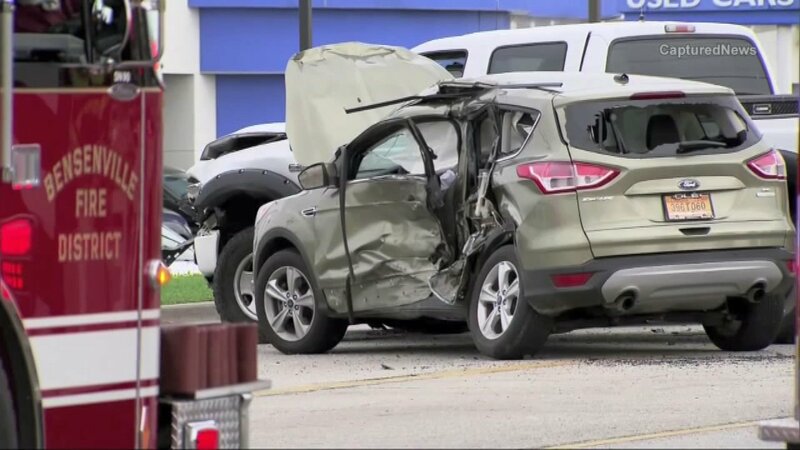 The six occupants of the Ford Escape, a 21-year-old driver and children ages 9, 8, 6, 5 months and 4 months, were taken to Elmhurst Memorial Hospital and Loyola University Medical Center for treatment, police said. The 5-month-old was transferred to Advocate Lutheran General Hospital. The driver of the pickup truck was transported to Elmhurst Memorial Hospital and the driver of the Toyota Camry refused treatment. No charges have been filed in connection with the accident and Bensenville police and the DuPage County Accident Reconstruction Team are investigating the crash.